Overacker Guitars is a division of Decent Exposure Photographics. 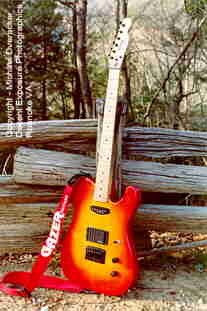 Overacker Guitars was started in 1992 as Gazer Guitars, a custom guitar builder for the demanding instrument buyer. Overacker Guitars are built to the customers specifications, and no design is completely ruled out unless physically impossible. Overacker Guitars uses domestic and exotic hardwoods and, sometimes, softwoods in the production of the guitars. We are aware and concerned about the senseless deforestation of the worlds precious rainforests and woodlands, and although much of the damage is not done in the name of wood exports, but in the name of grazing land, we still attempt to purchase "sustained yield" lumber if at all possible. We buy only from suppliers that we feel represent the best interest of the consumer and the earth and its limited resources. 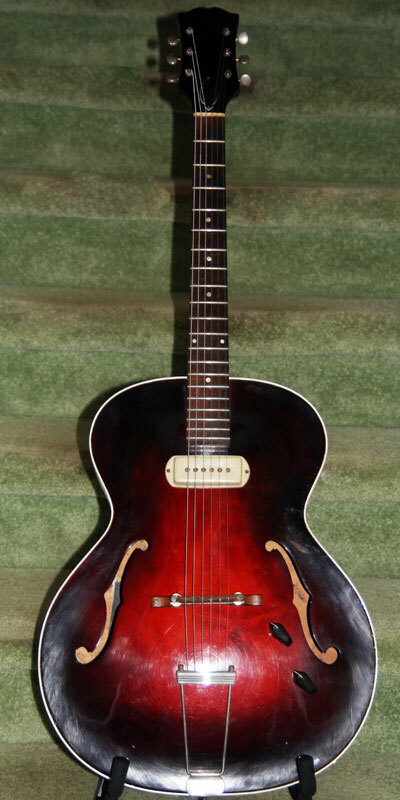 This guitar is a 1958 Guild X-50. The guitar was purchased with a poor polyurethane finish on it. Even with the bad finish, the guitar sounded fantastic, and was worth saving. The old clear polyurethane was stripped and sanded away, the old binding that was pulling away from the body from shrinkage was removed as well.. After some mild body prep, new cream binding was installed and trimmed for fit. Then a thin, dark cherry sunburst notrocellulose finish was applied front and back, as well as the sides. A thin clearcoat was added to protect the colorcoats, and the body was set aside to dry before polishing. No script Guild logo from the era was available. Not even Guild had it. So, I made my own. Now the guitar looks and sounds fantastic. This guitar is an extremely rare 1988 Gibson Les Paul Junior Pro. 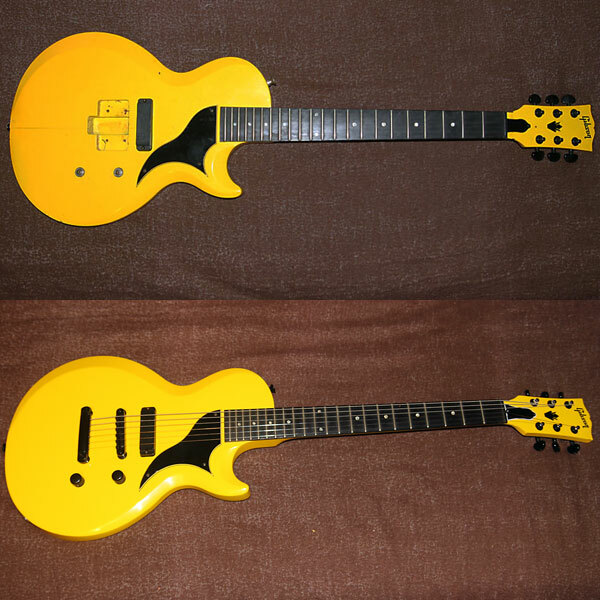 This guitar is also in the rare "Nuclear Yellow" finish. The guitar originally came with a poorly designed Steinberger KB tremolo system. It was not on the guitar when I purchased it, so I decided not to put the tremolo back on it. I made a form fitting Honduran Mahogany block to fill the area of the tremolo in the body. After clearing the tremolo rout or finish, I trimmed and glued the fill block into place. After some calculations, I drilled holes for the bridge and tailpiece in the correct positions. Matching this color was a nightmare, but after about a year, and some good advice from Chelsea Clark from "Guitars and Caffiene" in California, I was able to mix the color and shoot the guitar in original nitrocellulose lacquer. This guitar is an Overacker Guitar. The latest out of the Overacker Guitars shop. 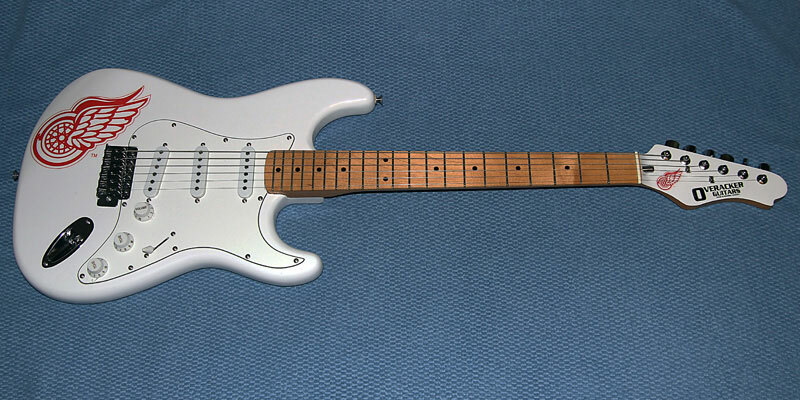 A Strat style guitar in a Bright White finish. Custom Detroit Redwings Logos were made and embedded in the finish on the body and the headstock. Standard triple single coil pickup design, white pick guard, tremolo tailpiece and silver hardware. This guitar is a Gazer Guitar, built by Michael Overacker. The guitar features a solid birdseye maple neck, mahogany body with a bookmatched flamed maple top. The pickups are a single coil Jackson in the neck position and a humbucking Jackson in the bridge position. The guitar has a toploading bridge and Schaller tuners in black chrome. The guitar has a LP style pickup selector and master tone and volume knobs, also in black chrome. The finish is a cherry sunburst in lacquer on the body and clear lacquer on the neck in a thin finish. 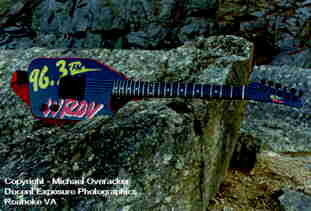 This image is a custom made guitar for a contest involving WROV-FM 96.3. The contest involved using the WROV logo in a unique way. The Guitar is a solid mahogany body, maple neck with a rosewood fingerboard. Schaller tuners, an AllParts Top Loading bridge and a Jackson Humbucking pickup fill out the top gear. The guitar was shot black, the logo was cut from vinyl and applied, and then multiple clearcoats before final buffing. The guitar won second place in the contest. My prize?.......a Peavey Electric Guitar signed by 38 Special. The guitar to the left is a 1958 Les Paul Special. I purchased this guitar to rebuild. It had a broken headstock that was improperly repaired at the wrong angle with epoxy and wood screws. I re-broke the headstock and carefully cleaned out the epoxy to get to some good wood. I wanted to strengthen the repaired area, so I routed an area in the headstock and neck and inlaid a piece of G10 fiberglass to reinforce the break. I then matched and cut 2 splints out of mahogany and grafted them above and below the break. The neck was then reformed. The mahogany splints were then darkened to match the old mahogany, and a small amount of matched finish was applied. The guitar plays, looks, and sounds great, and the repaired area is stronger than ever. 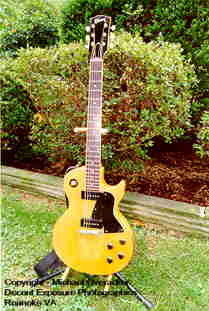 This guitar is a 1958 Les Paul TV Junior. I purchased this guitar to restore. It was painted an off-white color. What is unusual about this guitar is that it does not have the standard TV Junior headstock, as the headstock has a custom leaf Mother of Pearl inlay. I figured that this guitar had a original cherry finish, so that was the finish I was going to shoot. After I stripped the white finish, I was checking the guitar out and as I looked in the wire passages, I noticed the original TV finish. This guitar originally did not have a cherry finish. It was a TV Junior. I sent photos of the stripped guitar to Gibson, and they verified it was a 50's Junior, but did not have specific info from the serial number since records have been lost, but due to the headstock, it was quite possibly custom. 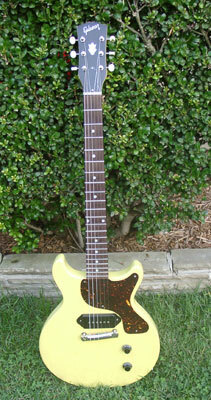 I refinished this guitar TV yellow using finishes from Guitar ReRanch and reassembled it. This junior ROCKS! It looks great, sounds great, plays great, and it is a welcome addition to my collection. Here they are together. Both have been restored to how they should look. 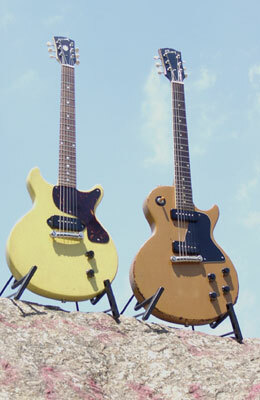 The 1958 Gibson Les Paul TV Junior on the left was refinished. The brighter yellow is the telltale sign. The 1958 TV Special has the original finish, darkened, no doubt, by many years in smoky bars and clubs. The headstock is holding up well, and she still plays like a dream. However, a refret may soon be in order, as the originals are getting thin.